​​​ AUSTIN – Rainey Street’s newest luxury high-rise condominium building, 70 Rainey, is slated to open by the end of 2018. Once complete, the 34-story building will include 164 luxury condominiums, a tenth-floor outdoor amenity deck with an infinity pool and dog park. 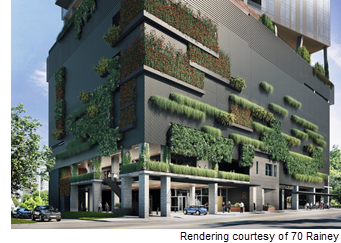 The building features a multi-story parking garage that will have green walls designed to preserve the canopy feel of Rainey St. The residential portion of the building is being built at an angle to the parking garage below, meant to off-set the looming high-rise effect on pedestrians.